"The Truth About Halo, Part 4: The Search for Halo"
Well, last issue we found out about Halo... now we just need to find her. We open on the now familiar scene of Halo's faceless nightmare... this time, however, she knows it's a dream... and finds the power to awaken, only to find that reality is so much worse than even the baddest dream. She finds herself surrounded by the aggie-shaped Aurakles... they are still trying to get the Halo "orb" to evacuate the body of Violet Harper. Halo begins weeping and resists... the bad balls ain't impressed... and ain't nothing changing their mind. We shift scenes to Tokyo, Japan where we observe Batman and the Outsiders soaring in the skies above. They are there at the request of Katana, who claims to know the way to recover their lost friend. Leaving her teammates on a roof, she enters the... I dunno, empty penthouse of her Godfather the Yakuza boss. The Godfather tells her they have no business and tells her to beat it. His bodyguards draw their weapons... which is a bad idea. Katana straight up KILLS everybody (save the Godfather). Like, she plunges blades into fools... slices them up... I mean, Batman should have a problem with this kinda stuff... right? Ehh, it's pre-Crisis... who knows. Katana signals for her teammates to join her, and the Godfather says he knows why she's there... and he'll help her, for a price. She's all "pshh... you see what I did to your army?" and ol' Oyabun decides discretion is the better part of valor. Now, it gets kinda weird... okay, not so much weird... but concerning things I have no experience with. Apparently, Katana's blade is a "soultaker"... meaning the souls of whoever (or whatever) she kills with it are trapped within it. The Godfather had the sword rack which allows Katana to communicate with the souls within. Among those souls was the Aurakle she slayed last issue... and by use of this strange Ouija sword (get it?) the Outsiders are able to find out where Halo is being held. And so, they travel to the whatever realm where the Aurakles are keeping their teammate. A battle rages over the next several pages with neither side really getting a decisive advantage. The Aurakles ain't letting their gal go, and the Outsiders ain't leaving without her. It comes down to Metamorpho taking the form of a long cable... who runs through the ethereal orbs... and Black Lightning conducting a whole lotta 'lectricity through him... and refusing to let up until the Aurakles let them go. 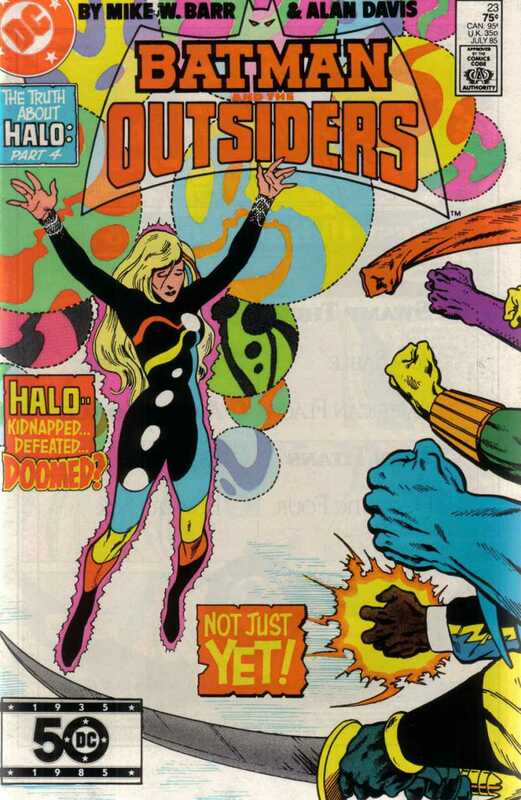 The bad balls drop the Outsiders off right at their front door, and all appears to be cool... until Halo announces that she's gonna step for a bit... she needs to know just who she is after all the spoo. Well, that was kind of underwhelming... not bad, per say... just not what I wanted from this storyline. I have no doubt that this was the original intention for the Halo character, but it almost feels as though they wrote themselves into a corner here, and concocted whatever story they had to in order to make everything fit and still redeem the character. I guess I'll get the art out of the way... it was very nice. In my review of issue #22, I wrote that Davis... while so very good, is no Aparo. I flipped through the issue again, and almost amended the review. Sometimes we need some variety. I gotta say, Davis' art (just like Willingham's in #14) were refreshing... not better or worse, just different... and made me take attention. The story itself... well, it didn't really feel like there was much of one. Batman outsmarted the Aurakles... and used the Outsiders to win the battle. Katana's bit in Japan was a bit bananas... didn't realize she was so bloodthirsty... and even more, that Batman was okay with her straight up murdering fools. That just seems weird to me. I don't see Batman watching one of his teammates plunge a knife into some dude's chest and nodding his approval. I did like the Black Lightning/Metamorpho deal that ultimately won the day. That was pretty neat, and a real novel way of using both of their powers. We end with Halo leaving to find herself... which is fair enough. She just had a major bombshell dropped on her... and it only makes sense for her to take some time to work through it and digest. Overall... not bad. Not great... but not bad. I must admit, I was much more gung-ho about this storyline at the get-go than I am now... but still better than a lot of stuff I've read, and definitely worth your time.